ILPA BUYER SELLER SUMMIT 28TH & 29TH JANUARY 2020, ITC SONAR, KOLKATA !!! 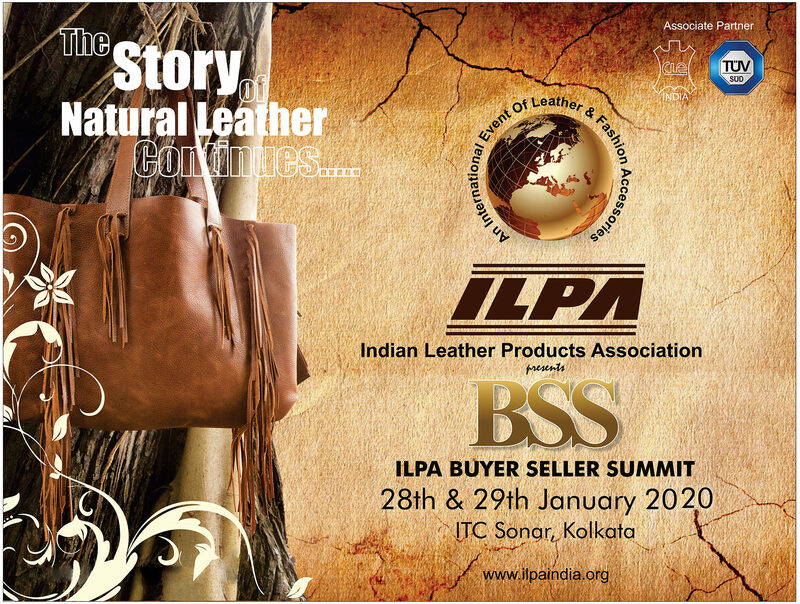 Indian Leather Products Association (ILPA) takes great pride in organizing “The ILPA Buyer-Seller Summit (BSS) 2020” to reach out to newer markets for showcasing premium quality leather products from Eastern India. The BSS will be held on 28th & 29th January at Hotel ITC Sonar, Kolkata. Timings are from 10 am to 6 pm. Kolkata Leather goods clusters are one of the most competitive hubs for premium quality Leather Goods production and exports to the whole world. The factories, all ILPA members, are socially complaint and well equipped to produce fashionable and high-quality products from the most economically priced leathers from local tanneries. ILPA aims to showcase through this BSS, some of the best manufacturers/exporters of Kolkata who will be displaying their outstanding styles and high-quality products. Most members are suppliers to many globally renowned brands, major retailers and chain stores. A highly focused B2B summit for leather, leather goods & accessories. 40 plus Socially audited & REACH compliant manufacturers/ exporters owning major factories with latest technology will be showcasing their products. Display of fashionable and high-quality products from the most economically priced leathers from local tanneries. Who should visit : Buyers / Importers from Brands, Retail Stores, Chain Stores, Independent sellers, Boutiques. Complimentary stay on 28th & 29th January 2020 nights along with free Wi-Fi & breakfast. Pick up & drop facility from the airport with every registration for overseas visitors (optional). Complimentary lunch, tea &coffee in the fair venue. Special room rates will be availed on registering directly with the hotel before October 2019 if visitors want to extend their stay (before / after) during ILPA BSS 2020. Gala Networking dinner on the Inauguration day. Factory visits may be arranged within the city limit on request after the summit. Complimentary language interpretation services will be provided to the foreign visitors. Visitors are requested to attend the summit on both the days to explore the new partners for better business.